A private company is targeting homes for clothing donations, passing itself off as a charity, Midlands Air Ambulance has warned. Misleading donation leaflets have been delivered to homes in Edgbaston, Birmingham, which suggest the proceeds will go to the Air Ambulance Service. The charity said it was "disgusting" a firm should profit from people who believed they were giving to charity. Anyone with concerns should ring the council's trading standards office. A spokesman for Midlands Air Ambulance Service said the offending leaflets even gave a telephone number to ring to for membership services which connected the caller to a premium rate number. He said: "We have been aware of this for the past three to four weeks. Our understanding is the company has no association or relationship with any air ambulance service in the UK. "It is a private company calling itself Air Ambulance Service but if you read the wording carefully there is no mention of where the money goes." The deception comes after Acorns Hospice, another Midlands-based charity, lost an estimated £30,000 in clothing donations when 300 fake collection bags were posted through people's doors in Birmingham. 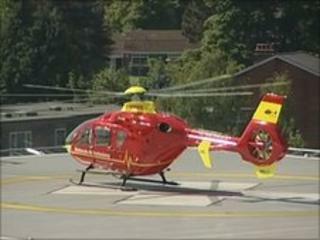 The legitimate air ambulance service operates three helicopters to convey people to hospital. It receives no government funding and has undertaken an estimated 30,000 missions since it was founded in 1991. It said it typically earned £200,000 to £300,000 from clothing donations per year but would hold other fundraising events to counter the impact of lost earnings due to the fake leaflets.